Hello and welcome to the Third Age RP. Whether you are new or old, this thread has been invented to help you familiarize yourself with the world we have created. As our name suggests, our story is taking place during the Third Age of Tolkien's Middle Earth. Numerous changes contrary to the original story have been made, and it is in this alternate reality of Tolkien's world we will roleplay in. The following is a timeline that depicts the changes that have taken place. TA 2 : The planting of the Second White Tree at Minas Tirith, Death of Isildur by orcs in the Battle of the Gladden Fields. Isildur himself loses the One Ring in the Anduin. TA 3 : Ohtar brings the shards of Narsil to Imladris. TA 10 : Valandil becomes the 3rd King of Arnor. TA 109 : Elrond weds Celebrían, daughter of Celeborn and Galadriel. TA 130 : Elladan and Elrohir are born to Elrond and Celebrían. TA 241 : Arwen Undómiel is born to Elrond and Celebrían. TA 420 : King Ostoher rebuilds Minas Tirith. TA 492 : The Easterlings invade Gondor. TA 500 : King Tarostar successfully destroys defeats the Easterlings, he changes his name to Rómendacil meaning "East Victor. TA 541 : Easterlings invade Gondor once more, slaying King Rómendacil. c. TA 550 : King Turambar of Gondor defeats the Easterlings of Rhûn; the Kingdom of Rhovanion becomes an ally of Gondor. TA 861 : King Eärendur of Arnor dies, his sons dispute over the Kingdom and after a bloody civil war, Arnor is divided into three smaller Realms. Arthedain, Cardolan and Rhudaur will dispute over the Weather Hills and other territories for hundreds of years to come. TA 933 : Eärnil I of Gondor takes Umbar in a surprise attack. TA 936 : Eärnil I lost at sea. TA 1000 : The Istari come to Middle-earth. TA 1015 : The Haradrim besiege Umbar in an attempt to recapture the city. King Ciryandil of Gondor is slain in the siege, Ciryaher takes the throne. TA 1050 : Ciryaher conquers Harad and takes up the name of Hyarmendacil meaning Southern-Victor. Gondor reaches the height of its power. The Harfoots cross the Misty Mountains into Eriador. Sauron takes up his abode at Dol Guldur, Greenwood is renamed Mirkwood. TA 1149 : Death of Hyarmendacil I, Atanatar the Glorious takes the sceptre of Gondor. Under his rule, the power of Gondor begins to wane. TA 1150 : The Fallohides migrate to Eriador. 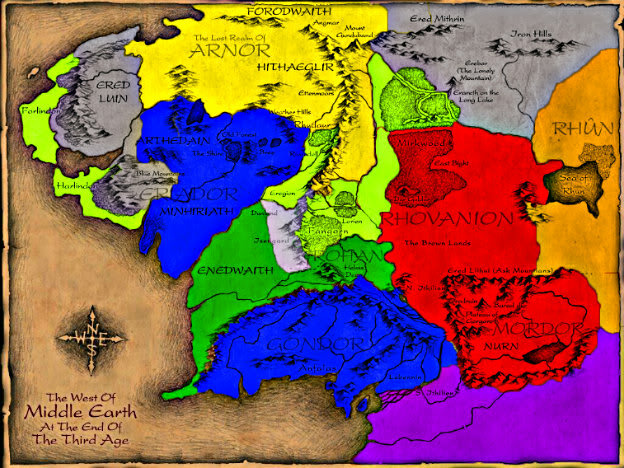 c. TA 1200 : Rulers of the Kingdom of Rhovanion assume the title "King of Rhovanion"
TA 1248 : Rómendacil II, the Regent of Gondor strikes a decisive blow to the Easterlings; forms a strong alliance with Rhovanion, to which he cedes all the lands east of Anduin. TA 1250 : Rómendacil II sends his son, Valacar to Rhovanion as an emissary. Valacar falls in love with Vidumavi, Vidugavia, the King of Rhovanion's daughter. TA 1300 : The shadow over Middle-earth lengthens. The Realm of Angmar is formed north of Rhudaur under the rulership of a Black Nûmenorian, later revealed to be Witch King. The Nazgûl begin to reappear. Orcs begin to infest the Misty Mountains. TA 1356 : King Argeleb I of Arthedain is killed in defence of the Weather Hills during an invasion by Rhudaur, now controlled by Angmar; his son, Arveleg I, ascends the throne. TA 1366 : Valacar ascends the throne of Gondor. TA 1409 : Cardolan is ravaged by the kingdom of Angmar and Rhudaur is terminated; Weathertop watchtower, and fortifications are burned and destroyed. TA 1410 : Carn Dûm is besieged by an army of Elves. TA 1432 : Eldacar succeeds his father, Valacar, as King of Gondor. Castamir the Usurper, Lord of the Ships, and a large following of Nobles are distressed by the half-blood King. They lay siege to Osgiliath. TA 1437 : Castimir breaks into Osgilliath. The Palantir is lost in the Anduin and the Dome of the Stars is destroyed. Eldacar flees Gondor, his son, Ornendil is captured by Castimir and executed. TA 1447 : Eldacar reclaims Gondor with an army of Northmen and kills Castamir at the Battle of the Crossings of Erui. Castimir's sons take refuge in Pelagir, Eldacar lays siege. TA 1448 : The sons of Castamir the Usurper and most of the fleet of Gondor flee south to Umbar, and become known as the Corsairs of Umbar. TA 1540 : King Aldamir of Gondor is slain by Haradrim in the Siege of Umbar. TA 1600 : Two Fallohide brothers Marcho and Blanco decided to cross the River Baranduin, later Brandywine and settle on the other side, and are followed by large numbers of Hobbits. King Argeleb II gives permission of the founding of the Shire. TA 1601 : The Shire is first settled by Hobbits. TA 1634 : The Corsairs of Umbar attack Gondor, slaying king Minardil at Pelargir, and raiding the city. TA 1636 : The Great Plague decimates Gondor and Rhovanion, the watch on Mordor is abandoned and the Undeeps are deserted. TA 1810 : King Telumehtar of Gondor destroys Umbar; renames himself Umbardacil. TA 1851 : The Wainriders overrun the Kingdom of Rhovanion. TA 1856 : The Wainriders first attack Gondor. TA 1964 : Arvedui, son of King Araphant of Arthedain, ascends the throne. TA 1970 : Elion, son of Elrond and Celebrían, and his twin sister, Allynna, are born. TA 1974 : The kingdom of Arthedain is conquered by Angmar. TA 1975 : Gondor destroys Angmar in the Battle of Fornost, death of Arvedui. TA 1980 : The Moria Dwarves awaken Durin's Bane, a Balrog, which kills Durin VI, king of Khazad-dûm; the Nazgûl return to Mordor and lay siege to Minas Ithil. TA 1981 : Durin VI's son, Náin, is also killed, and the Dwarves flee Moria; deaths of Amroth and Nimrodel. TA 2050 : The end of the royal dynasty of Gondor (until the return of King). TA 2430 : The approximate birth year of Sméagol. TA 2460 : Sauron returns, possessing one of his to lieutenants. TA 2501 : Eorl the Young, lord of the Éothéod and 1st King of Rohan (2510–2545). TA 2509 : Cirion, Steward of Gondor, sends summons to the Éothéod for military aid; Celebrían is waylaid by orcs, receives a poisoned wound, and consequentially departs Middle-earth. TA 2545 : Eorl the Young, 1st King of Rohan, dies in the battle in the Wold against the Easterlings. Brego succeeds him as the 2nd King of Rohan. TA 2570 : Aldor, aged only 26, becomes 3rd King of Rohan at the death of his father Brego. TA 2645 : Fréa becomes 4th king of Rohan after the death of his father Aldor ('the Old'). TA 2746 : Amrothos, 15th Prince of Dol Amroth, falls while defending Dol-en-Ernil against the Corsairs of Umbar. TA 2758 : Dunlendings, under Wulf, invade Rohan, supported by the Corsairs of Umbar. Long Winter of TA 2758 - 2759 : The Dunlendings lay siege to Hornburg. TA 2759 : Helm Hammerhand, King of Rohan, is killed by the Dunlendings. He is succeeded by his nephew Fréaláf Hildeson; Saruman settles in Isengard. TA 2763 : Balin is born. TA 2783 : Glóin is born. TA 2798 : Fréaláf Hildeson, 10th King of Rohan, dies. He is followed by his son Brytta Léofa. TA 2799 : The Battle of Azanulbizar is fought on Moria's East Gate, in which the Dwarves. defeat Sauron's minions but are defeated by the Balrog Durin's Bane. TA 2842 : Brytta Léofa, 11th King of Rohan, dies. Succeeded by his son Walda. TA 2851 : Walda, 12th King of Rohan, is killed by an orc, his son Folca succeeds him. TA 2864 : Folca, 13th King of Rohan, is killed by the Boar of Everholt. He is succeeded by his son Folcwine. TA 2879 : Gimli son of Glóin is born. TA 2885 : Harondor is once again claimed by the Haradrim, supported by the Corsairs of Umbar. TA 2890 : Bilbo Baggins is born. Fell Winter of TA 2911 - 2912 : Wolves invade the Shire. Tharbad is ruined in the following the floods. TA 2930 : Arathorn II becomes the Chieftain of the Dúnedain. TA 2933 : Arathorn II is killed while hunting orcs. TA 2933 : Brother of Arathorn II becomes the Chieftain of the Dúnedain. TA 2934 : Denethor is assassinated by Harad Assassins. Arathorn's brother returns as King of Gondor. TA 2935 : Fengel, King of Rohan, is killed by Orcs from Isengard during a diplomatic mission to Saruman. TA 2935 : Saruman is killed by his apprentice. Apprentice rises to power. TA 2937 : Dáin, Thorin, Elrond, Elladan, and Elrohir, lead an army to retake Erebor. TA 2938 : The attempted recapture of Erebor ends in failure leading to the deaths of Dáin, Elrond, Elladan, and Elrohir. Ulrin and Elion are crowned kings of the Dwarven and Elven kingdoms respectively. Arwen departs for Undying Lands grieved of the loss of most her family. TA 2939 : Ulrin begins plans with Elion over a second attempt to recapture Erebor. TA 2940 :The attempt to recapture Erebor was succesful and Ulrin grants Elion the town of Dale, below Erebor in order to improve Elvish-Dwarf relations. They then begin the rebuilding of both cities. TA 2941 : Rebuilding of Erebor is complete. Mordor gears itself for war, gathering its allies. Meanwhile the Free Peoples of Middle Earth prepare to defend to the last. TA 2941 : Present day. It's the third age, and the year is 2941. Middle Earth is at the brink of war, Sauron has returned to his tower in Mordor and amasses his allies, the Orcs in the mountains, the Easterlings, and the wizard in Isenguard, ready to conquer Middle Earth. In his way stands the men of Gondor and Rohan, the free peoples of Eriador, the mighty dwarves and the graceful elves. The ring still remains hidden from Sauron and the peoples of Middle Earth, but the war presses on as both sides arm themselves for battle. Which side will you choose? Being one of the first inhabitants of Middle-earth, the elven numbers dwindle, as some depart to Valinor, while others are killed in battles with orcs. However, there are those who stay, fight and live on. They are united under a single ruler and are prepared to fight to the last breath against the evil of Sauron, that plagues the land. The story of the united Elven clans. Details about the Elven ranks and the elven armed forces roster. Details about the structure of the Elven army. Details on Elven NPC troops usable in battles and quests. Details on Elven combat specialisations. Details on the gear which Elves use. Notable Faction NPCs are found here. Here you can sign up to join the Elven clans and military forces. If you believe you have done all that is neccessary to be promoted, post here. In need of training? Sign up for a class. Here you can undertake, or submit quests. Details about elven relations with other factions. Details about the council and council meetings. The servants and forces led by the wizard of the White Tower, sworn to obey him and ultimately serve the dark lord. They reside within the walls of the Isenguard fortress, where they are bred, trained and prepared, for the war, which is soon going to consume Middle-Earth and all it`s inhabitants. Here you can sign up to join Isenguard. The structure of the Isenguard army. Description of the ranks and types of troops in the Isenguard army. Description of the ranks of magic. Details on Isenguard NPC troops usable in battles and quests. Description of the weapons used by the Isengaurd forces. The orcs which inhabit the mountains, east of Rivindell and west of Mirkwood, as well as the plains of Arnor. These orcs are fierce, having grown in the mountains, they are more resilliant and battle ready. They have their own king, but ultimately their allegiance is to the Dark Lord. History of the mountain orcs. Description of the orcish ranks and troops. Description of the military breakdown of orcish NPC troops usable in battles and quests. The throne room of the orcs. Here you can sign up to join the orc forces. Here you can request to be promoted. The roster and ranks of the orc army. The Dwarves are the staunch protectors of Middle Earth. They field one of the largest armies, as well as the strongest. They are sworn to protect Middle Earth till their final breath, and are eager to destroy the Orcs. Information on the Council and its purposes. Information on Dwarven Relations with other factions. Information on the three main Halls of the Dwarves. Article on Dwarven Characteristics, and Customs. History on how the Dwarves came to be and what they have done till now. The ranks of the Dwarven Army and their duties. Details on every Dwarven Unit(Exception of Siege Units). The Siege Units of the Dwarven Army. All the units of the Dwarven Army. Where you sign up to join the Dwarves. Having endured centuries of hardship, the nation known as Harad has reached the peak of it's power. It's king rules with an iron fist and black heart filled with avarice, and the people have toughened into something similar. With a massive army of elite soldiers, unique war tactics, and battle machines and creatures, the Haradrim is a major power in Middle Earth. With the means to crush all who stand in it's way, Harad looms over it's borders while it's enemies cringe in fear. As the name suggests, this is the place to go to request a promotion and sign-up your newest Harad player character. All the ranks and hierarchy of the faction. Military: Branches, Divisions, and More! An enormously helpful thread detailing all you need to know on how Harad's military ticks. A thread that contains all the information concerning Harad-staff controlled NPCs. Useful if you want to see somethings we look for. The details on all of Harad's history, straight up from the beginning. This is the list of all approved Harad PCs as well as NPCs.